Friday. While leaving work I think "it is time to go the gym again, I haven't been there for almost a week". So there I go, to the 24Fitness in Plantation. I still don't like that they lied to me when I signed up ("is open 24 a day except for weekends but next month will be 24/7, weekends too"... that was on August 2006... when I complained they explained to me that it was delay until January 2007... Is April and I am still waiting for it to be 24/7! ), but, whatever, is open 24 hours a day during the week, so it takes one excuse away from my list when I am not in the mood to go. I enter the gym and noticed that there is something new, and that was external advertising. Until now, all the advertising inside the gym was about the gym. Well, good for you, you got a secondary income, not a bad idea, maybe you should consider lowering the monthly fees, considering the ads. First ad I see was from Hotels.com "You take care of your upper body, we do the leg work". Cute. But the second ad, I just couldn't believe it! I mean, I know advertising is money and business is business, but I find the ad a bit unrespectful. Let me explain it better: in this gym I have seen a lot of people exercising not to stay in shape but to have some type of shape. Obese people. People that really need to excercise and lose pounds not for their image but for teir health. I assume most of those are torturing themselves with gym and diet, but they need to. Is for their own sake. And while 24Fitness is helping them with with their fitness program and their continuos speech about health adn fitness... the allow an ad inside the gym that is 'temptation island' for ANYONE on a diet. To make things worst the ad does not say anything about that frescata being low calories or low carbs or anything on that sense, and I assume it is not, considering that is has a Dijon Ranch and white bread. Does this ad make sense in a gym? 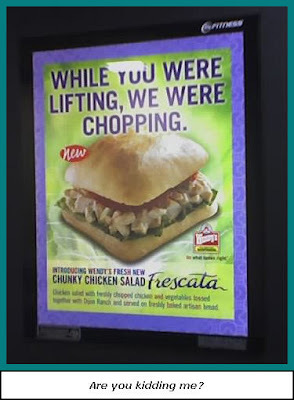 Shouldn't the ad say "if you miss the pounds that you've lost here, get them back at Wendy's with our new frescata"? mamma mia!